Found 2 file extension associations related to Batch Compiler and 2 file formats developed specifically for use with Batch Compiler. Batch Compiler is a Front End program designed to compile all your maps in the simplest and fastest way possible, batch files. The program works on Batch Compiler Specification (BCS) files which are dynamic configuration files capable of specifying almost everything in Batch Compiler, from the switches, to the way the batch file is written and what is written where. 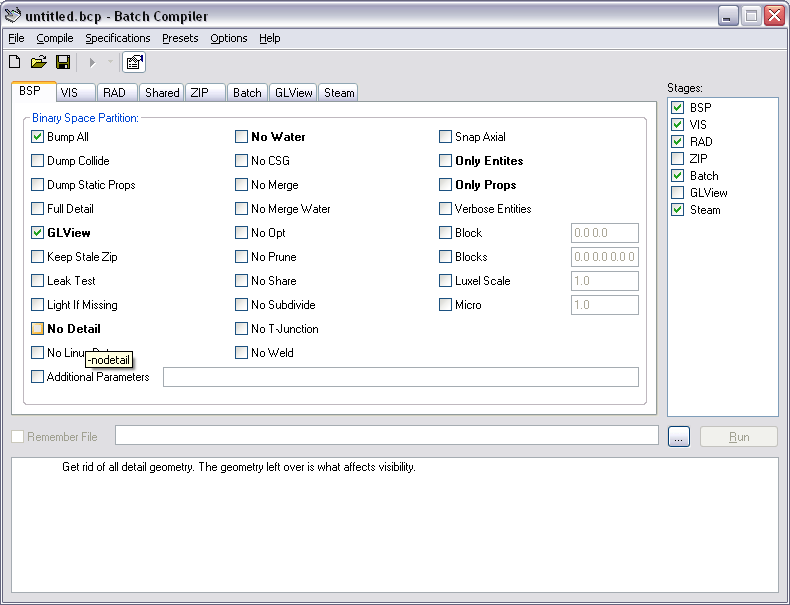 Batch Compiler comes with specification files for the current Source Tools, Zoners Tools, the old Quake Tools, HLFix, RESGen, Map Backup and many other programs. Each switch contains a brief description on what it does to help make everything easy and centralized. If you need more information please contact the developers of Batch Compiler, or check out their product website.